Four-time AIR Award nominated post-punk band RVG have made their debut in the historic BBC Maida Vale Studios in London for Huw Stevens show on BBC Radio 1. Performing a three-song session with tracks taken from their critically acclaimed debut A Quality of Mercy, Melbourne’s RVG join the list of artists who have recorded inside the prestigious studios, which doubles up as the home of the BBCSymphony Orchestra, alongside the likes of Led Zeppelin, David Bowie and Oasis, and recent contemporaries Haim, Arctic Monkeys and Florence and the Machine. 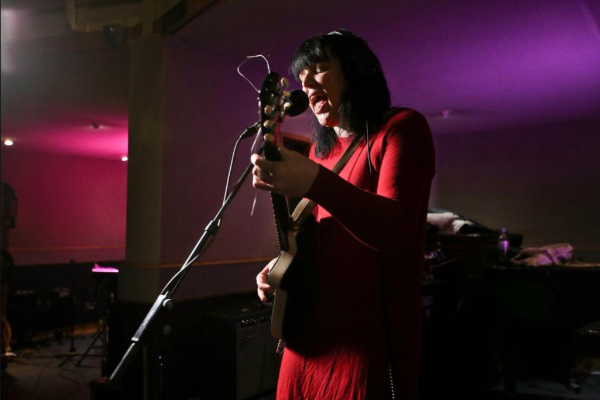 Listen to RVG in session at BBC’s Maida Vale Studios here. The live session shows RVG in all their glory as they tear through ‘A Quality of Mercy’ – with a sneaky lyric swap to hit the UK audiences – ‘I Used to Love You’ and ‘That’s All’ with unrelenting passion and power. The session was recorded whilst RVG were on tour in the UK and Europe for a second time this year throughout July. As well as shows in London, including an instore at the iconic Rough Trade East,RVG performed incredible festival sets at Roskilde Festival in Denmark, Festival Les Escales on the west coast of France, plus a string of headline shows across the rest of England and France. RVG – Romy Vager (vocals, guitar), Reuben Bloxham (guitar), Angus Belle (bass), Marc Nolte (drums), known less formally as the Romy Vager Group – deliver a refreshing kind of honesty and intelligence that you don’t hear in your everyday garage band. The eight songs on A Quality of Mercy traverse through the myth of the tortured artist, the isolation of self discovery, falling in love with a computer and the feeling of awaiting your fate on death row. Earlier this year, RVG headed overseas for the first time to showcase at SXSW and The Great Escape festivals before touring across Europe with UK buzz band Shame, and subsequently signed with Fat Possum who re-released their debut album A Quality of Mercy in the UK at the start of July. You can catch RVG live at WinterWild in Apollo Bay later this month, and Kyneton Music Festival in October. Romy will be in conversation with Rob Snarski as part of the Melbourne Writers Festival Duets series this year, and at Melbourne Festival as a special guest as part of 16 Lovers Lane.